Since he started competing in the Pro Modified Racing Association seven seasons ago, Bruce Boland has raced a different car each year. 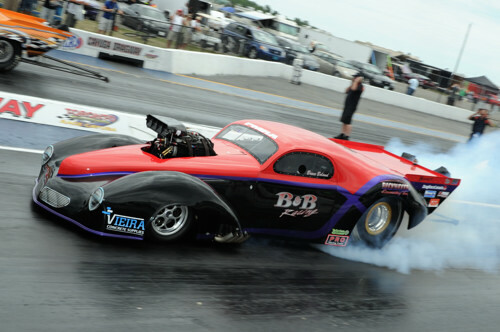 And in 2011, he continued with that trend, debuting his Larson Built 1941 Willys Pro Modified. With almost zero seat time in the new car, the three-time PMRA champ not only established a personal-best run, but qualified number one for the PMRA opener held at the Cayuga Dragway of Toronto Motorsports Park. His qualifying pass of 5.953-seconds, 235.47 mph put him at the top of the ladder. The B&B Racing Willys is powered by a 526-cubic inch Brad Anderson (BAE) engine, tweaked by Carl Spiering of Engine Research & Development. A PSI C-Screw-type Supercharger sits atop the engine and a Lenco three-speed transmission sits behind the engine. The car is a Larson Race Cars product from Missouri, and Boland added the car was used chiefly in ADRL competition before he acquired it. At the midway point in the 2012 PMRA season, Boland sits atop the points race with 1 win and a handful or records and No. 1 Qualifying efforts. This comes as no surprise to anyone as Boland drove his Larson Built Willys to 2 wins in 2011 and a handful of No. Qualifying appearances in only his first year with this car.